In my first year at the University of KwaZulu-Natal I was awarded an academic scholarship by Afrox to study mechanical engineering. A condition of the scholarship was that I had to work for Afrox during my summer holidays. My first job was at the Afrox gas plant at Maydon Wharf in Durban. On my first day I was issued with company overalls, gloves and boots and the engineering manager assigned me to a boilermaker as an assistant. I was basically the boilermaker’s gopher, although he took the time to teach me how to weld while also explaining the scientific theory behind the work he was doing. I truly enjoyed my time with him as he had deep technical insights. I see both my parents as role models. They were both teachers who served their communities, though later my mother left the teaching profession to start a general dealer store. Nothing was impossible for her. She was the first woman I knew at the time who had a code 10 driver’s licence. She used to drive her truck to fetch goods from Mthatha for the store. She broke all the rules in terms of a woman’s place in society. She worked extremely hard to provide an education for her children and, thanks to her efforts, my siblings and I all received tertiary degrees. She produced two engineers, a medical doctor, a physiotherapist and a lawyer. Who said our circumstances define us? “The things you take for granted, someone else is praying for.” In general, South Africans across colour lines complain a lot. We don’t seem to appreciate what we have and from time to time we need to stop and reflect. For example, our country is relatively peaceful, while the people of Syria live in constant fear. We also complain about poverty and, yes, while we do have poverty we have a government that supports 16.5m needy people through social grants. What about countries like Zimbabwe, Malawi, Lesotho and Swaziland where there are no safety nets? Of course South Africa has huge potential and of course we should strive to be better, but we should also appreciate what we have. I use an iPhone 7. This phone is still serving me very well, so I see no need to upgrade. I am relatively new to the Apple ecosystem as I used to lead Microsoft in South Africa during the Steve Ballmer years and at the time employees were not allowed to use Apple products. It is refreshing to see that Satya Nadella has done away with that practice. “Microsofties” are now free to use Apple devices. I am reading a book by Ronald A Heifetz and Marty Linsky called Leadership on the Line: Staying Alive Through the Dangers of Leading. Born to Succeed, by Colin Turner; You’ll See It When You Believe It, by Dr Wayne Dyer; and Strategy of the Dolphin, by Dudley Lynch and Paul L Kordis. I truly enjoy my Microsoft Surface Tablet. I no longer need to carry a laptop and this substantially reduces the load when I am travelling. I am also a big fan of the Microsoft Surface Pro 4 with a Type Cover. The highlight of my career so far has been the opportunity to turn around Altron — an iconic South African company. This is an organisation that was founded by Dr Bill Venter in 1965 and has contributed enormously to the development of South Africa. However, over the past few years it has fallen on hard times. My leadership team and I have an opportunity to take Altron to levels never seen before and I am happy to say that the group is emerging from its challenges to a company where Altronians from all walks of life wake up every day and bring their A-game to serve our customers and communities. It is an honour to be part of the team that is building this world-class company that truly values diversity and inclusion. I love comedy. I use jokes and laughter to cope with stress. That is why I insist that we create an environment where we work hard but we also have fun. 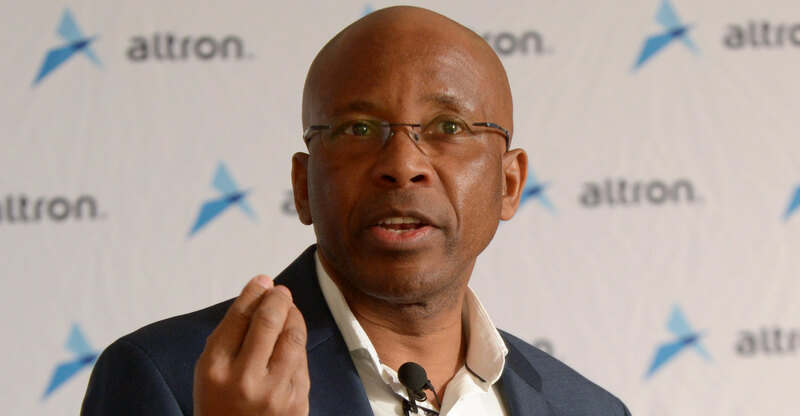 Recently, at our 2018 Altron Kick-Off employee event at the Kyalami Conference Centre, we engaged well-known comedian Mpho Popps Modikoane as our programme director over the two days and it was two days of hard work and “serious” fun. He truly is crazy and very, very smart. As a chief executive, I have to go through many documents and it takes a lot of time. I wish I had learnt speed-reading. In fact, I am thinking of developing a technology that can read these documents for me and upload the information and insights directly into my brain! The way we read in the digital age is so inefficient and I have no doubt that there will be breakthroughs in this area soon. This will help level the playing field in a world that favours the haves.